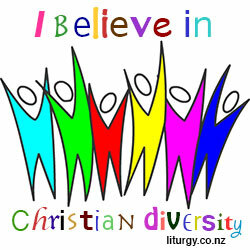 Bosco Peters, the Anglican New Zealand priest who writes the Liturgy blog, has declared January 27, 2013 – February 3, 2013, the Week of Prayer for Christian Diversity. The octave of prayer for diversity is analogous to the established Week of Prayer for Christian Unity. Unity in the Anglican Communion is taken by some to require uniformity, and Peters’ newly declared week is intended to promote the acceptability of the notion of unity in diversity. His blog post on his declaration is here, and the logo he has designed to celebrate Christian diversity is shown below. What Would an Ideal Anglican Communion Look Like?